Too Busy for Your Morning Cup of Joe? 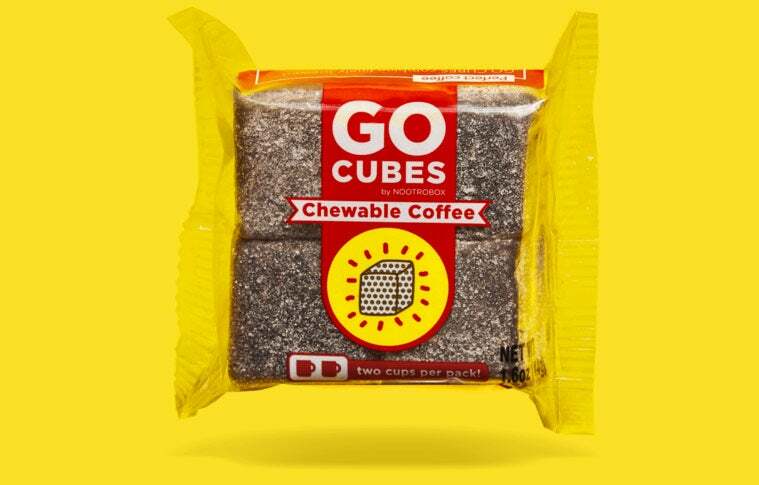 Chew on These Caffeinated Cubes Instead. Wake up and chew on this buzzy cud: If you don’t have time to sip your morning cup of Joe, you can now eat it instead. The soft, square gummies are made with cold-brewed coffee, along with sugar and corn syrup to cut the bitterness. Dusted in sugar crystals, the gooey brown lumps come in three flavors -- “Mocha,” “Pure Drip” and “Latte.” Bonus: no spills. Safety-wise, Geoffrey Woo, Nootropics CEO and co-founder, points out on Product Hunt that the ingredients in Go Cubes are GRAS, generally recognized as safe by the FDA. However, it’s noted on the Go Cubes website that his company’s claims about the chews have not been evaluated by the government agency. Woo and his lean startup team successfully crowdfunded the pocket-sized bites on Indiegogo late last year, blazing past their $20,000 funding goal. The total haul: $61,516. We’re interested to see if these clever caffeine cubes -- hyped as “the future of coffee” -- really take off. Especially when there’s already so much competition brewing in the caffeinated munchies department, not to mention the exploding multibillion-dollar energy edibles arena -- shots, drinks, oral sprays and all. As for the taste, we’re curious about that, too. We reached out to Nootrobox to request review samples. In the meantime, we’re drinking up others’ reviews, like this fun one from Business Insider reporter Lydia Ramsey. "The aftertaste was basically like drinking nothing but coffee for a week while not brushing your teeth," she said. Yum. Meanwhile, YouTube reviewer Darren Herczeg described chomping on the potent chews like so: "I sink my teeth into it and the first bite I get is this beautiful explosion of delicious coffee. It is definitely for people who like black coffee more so than for people who like coffee with cream and sugar." Down to give Go Cubes a shot? You can order them online in packs of four (priced at $59 for 20 four-packs). Go easy, killer. Each pack is equivalent to two cups of coffee. Which Country Has the Cheapest Cup of Coffee in the World?